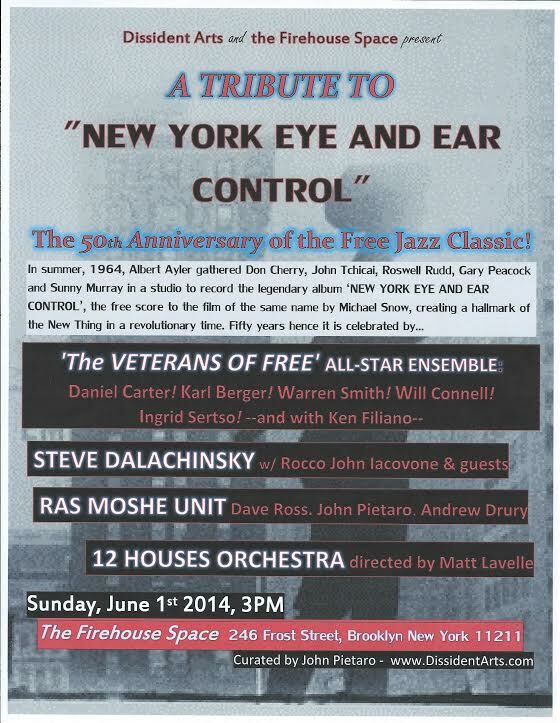 The summer jazz concert season kicks off to an early start with a rousing tribute to the celebrated recording ‘New York Eye and Ear Control’ as it hits its golden anniversary. This seminal album of the Free Jazz canon was conceived by Albert Ayler and realized with an all-star ensemble of improvisers who defined the movement. 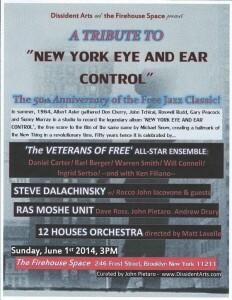 Some fifty years hence, a wide swath of New York Jazz underground instrumentalists fete it with four sets of contemporary fire music. The headliners are a one-time only assemblage dubbed here as The Veterans of Free, a combo of artists who were vital parts of the scene during Free Jazz’s development and still stand now as leading figures. And the opening attraction is celebrated downtown poet Steve Dalachinsky whose mix of spoken word and improv crosses the decades. The other artists performing represent the improvisational new music sounds of the past thirty+ years heard in Manhattan and Brooklyn performance spaces right into today. This event will be comprised of three 50-minute set with each of the three bands performing a piece inspired by one of the three improvisations heard on the classic album. They will complete their sets with music which illustrates the legacy of the New Thing.